Home World Affairs Philippines: Indonesian hostage held by terrorists swam his way to freedom. Philippines: Indonesian hostage held by terrorists swam his way to freedom. In the Philippines, an Indonesian hostage held by terrorists swam his way to freedom while his companion drowned. Another Malaysian captive was shot in the back while escaping, the officials said. 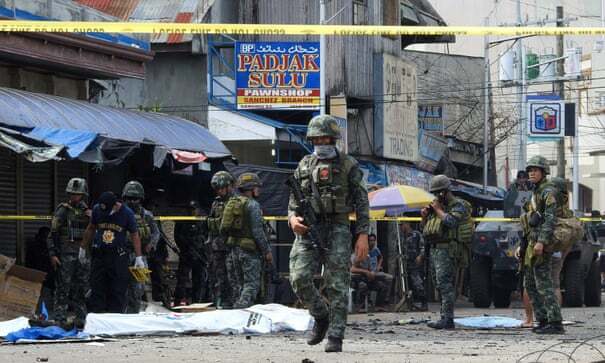 The Phillipine marines gunned down three terrorists who were trying to chase the two Indonesians at sea. The three hostages were kidnapped from Malaysia’s Sabah state on Borneo island in December last year and taken by speedboat to Sulu province in Phillipines. Military spokesman Lt. Col. Gerry Besana said that the hostages escaped while the Marines were attempting to rescue them from Simus Island in Sulu. At least three more hostages are still in the custody of the Abu Sayyaf terrorist group. In a separate incident, army troops yesterday clashed with about 80 terrorists of Abu Sayyaf group in Sulu’s mountainous Patikul town. The gun battle left three soldiers and four terrorists dead and several wounded on both sides, the military said. Previous articleMaldives: Polling going on smoothly for election to 19th parliament.